ShortScale :: View topic - Anyone used these trems before? Anyone used these trems before? Posted: Sun Feb 02, 2014 8:19 am Post subject: Anyone used these trems before? Anyone have any experience? Are they serviceable? Could you do drop tuning without major problems? 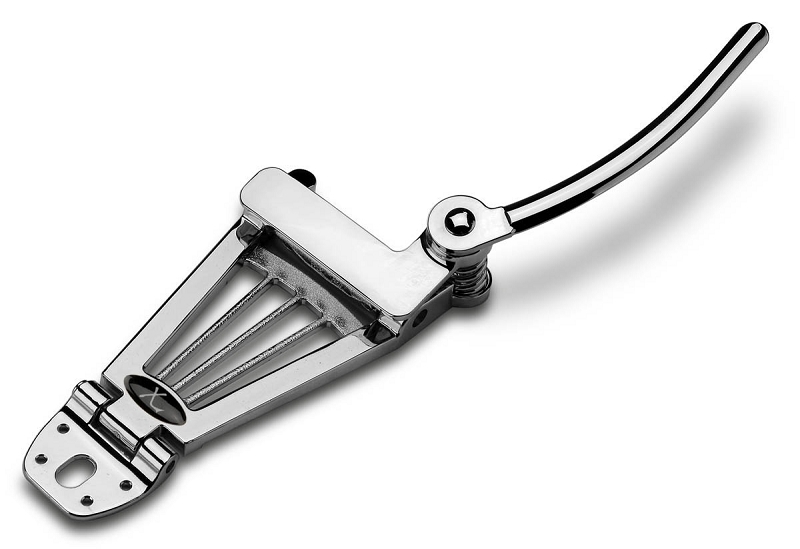 i had one similar from gfs, not sure if they still sell them..
as an alternative to $100+ on a bigsby, the $20 i paid was worth it. is that going from standard EADGBE to CGCGCE on the fly? if so that might be beyond what i need. i mainly just change from EADGBE to EGDGBD (open g tuning, keep the low e), so really just two strings detuned a tone each. how was the actual action? smooth, usable? i have 3-4 songs in my set i play in CGCGCe, and the rest in standard, usually try to put them together, but sometimes that doesn't happen..
it reacts quite a bit like a 60s Hagstrom top trem. 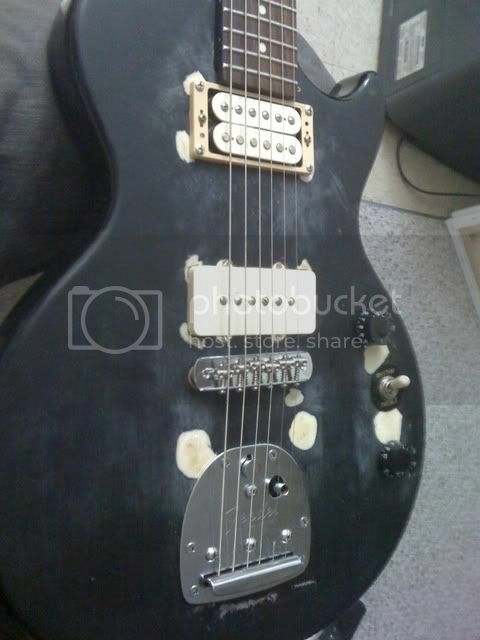 I actually quite liked it, just sadly don't have the guitar that I had it on anymore..
found the action to be v. smooth, though for a bridge i prefer a mustang or jag/jazz bridge, and those end up in everything i use with a trem (aside from the epiphone LP that i put a jazz trem on, it kept the TOM) and found the tuning to stay quite reliable. mind i also play .12-.54 strings.. so there is that to keep in mind as well. thanks man, that's really helpful. yeah a jag trem is my number 1 choice, but i don't know if i have the gumption to work out routing a les paul-esque body for one. i like the idea of just drilling these cheap ones one on. nice and easy. 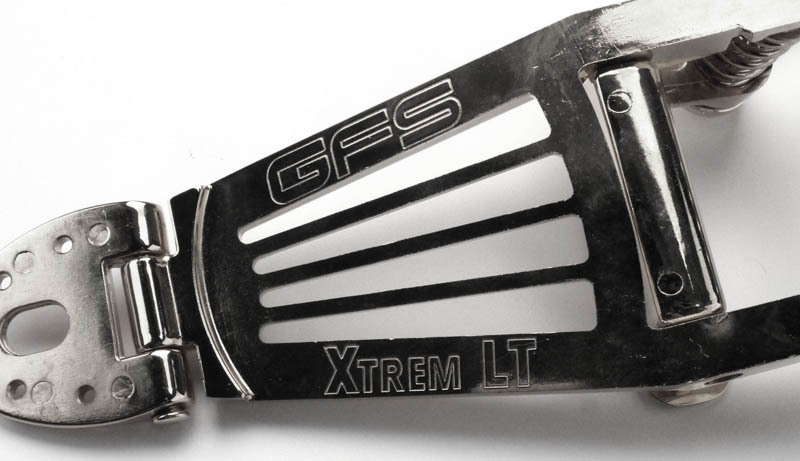 i also have one of the new gfs xtrems, but i'm not convinced because it only screws to the tail end, not on the top, so i think there are going to be issues with stability and drop tunings because the tension of the strings is pulling against the trem in one line, whereas if it's screwed down it doesn't matter so much. i don't know, maybe it'll be okay. it is kind of clunky and heavy too, mind. they don't screw down anywhere near the bridge side? how would that be stable? i guess it could work? they do screw down under the bridge they don't. but what are those two holes for? the felt pad? and save the extra coin for beer with friends, or a router bit to cut in a jag trem plate. nah it doesn't screw down to the body at all, just the tail. i have one in my spares box right now. lol, i think i agree about the cheaper one in the op. i might buy one for something else. ah, yeah.. that'll do it..
i was only able to get away with the jag due to it being a flat epiphone lp, not a arched gibson..
do an test, and an demo. plan on it! it's currently at a tech getting a nice fret level and crown. when i get it back i'll finish gretsching it out with this trem. it's already got those gfs surf 90 dynasonic clones in. they sound sweeeet. That x-term should do great. I have the top mount one and it works flawlessly. The one you have should be fine. Big heavy mass and lots of surface contact with the body. It is not going to wiggle around. 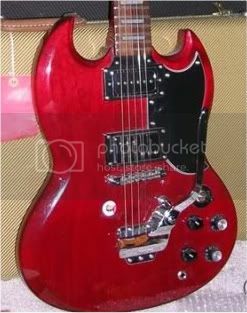 In my opinion he teisco type things work ok but are kind of tiny sounding, but I have only played them with the crappy thin teisco type bridges. 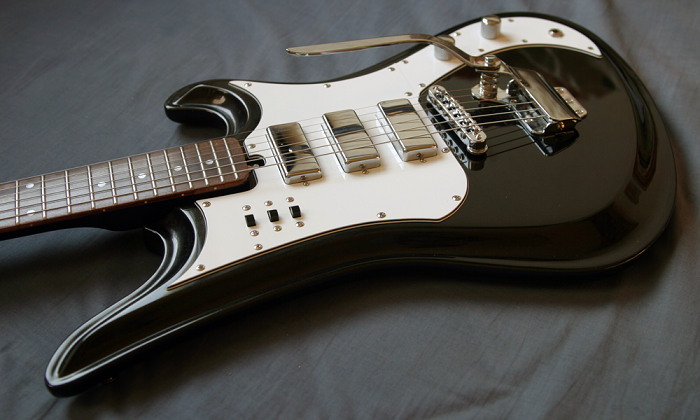 GFS still sells the teisco type one Link. thanks that's reassuring. i tried out a few real bigsby b5s the other day (the body mounted ones for those unfamiliar), and it handled alt tunings fine. I guess there's no difference then that it isn't screwed down to the body. I have one of those cheap ones to sell. I would just send it if you weren't in Oceania. I just saw a Bigsby Tele setup for sale on TDPRI. I had been looking for years for one and just got it last month. The one for sale is $100 with all the extras (vs. the $160 it costs new). I bought the F version though. Very psyched. Love teh whams. I had one on my Epi G400 for awhile and it may make the leap to one of my Juniors. It worked great. The rest of the guitar's setup (bridge and nut) is dependent on it and I did end up using a roller bridge to make it more efficient when I dipped the bar and keep the low strings in tune a little better. It is very Bigsby-like and sounds like it. They aren't "serviceable" really, they just do what they do... you can't set bar height/tension or anything and stuff works its way loose every so often.